Germany: The German Workers' Party (DAP) is officially renamed the National Socialist German Workers' Party, or the "Nazi Party" (NSDAP) for short. 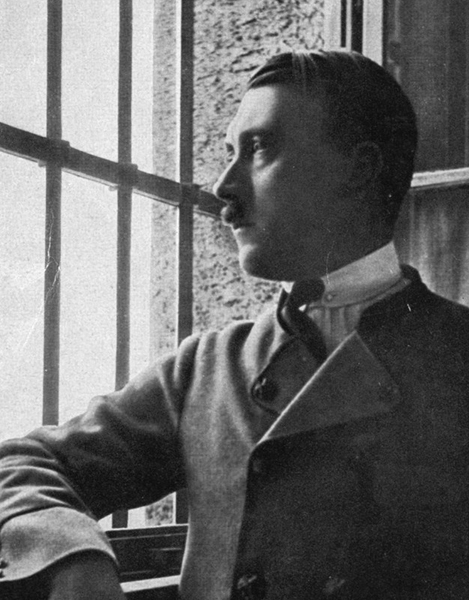 Germany: Adolf Hitler is sentenced to 5 years in prison for his participation in the unsuccessful Beer Hall Putsch, but he will be released after serving only 9 months, during which he will dictate Mein Kampf. The 09 Nov 23 "Beer Hall Putsch" or "Munich Putsch" was an attempt by the Nazi Party at seizing the German government by force. Hitler hoped that his nationalist revolution in Bavaria would spread to the dissatisfied German army, which in turn would bring down the government in Berlin. 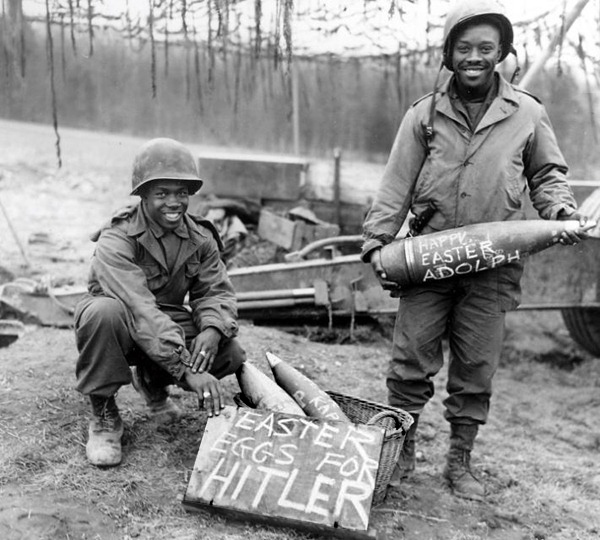 However, the uprising was immediately suppressed, though 16 Nazis and 3 policemen were killed, and Hitler was arrested and sentenced to five years in prison for high treason. Sent to Landsberg jail, Hitler spent his time dictating his autobiography, Mein Kampf, and working on his oratorical skills. After nine months in prison, political pressure from supporters of the Nazi Party forced his release. During the next few years, Hitler and the other leading Nazis reorganized their party as a fanatical mass movement that was able to gain a majority in the German Reichstag by legal means in 1932. Germany: An SA rebellion led by Walther Stenners briefly overturns the Nazi leadership in Berlin, only to be swept aside by an emotional appeal by Hitler expressing party loyalty. Germany: The Nazi Party boycotts all Jewish shops, attorneys and doctors across Germany. Jewish students are also barred from German schools and universities. CBI - China: Day 91 of 142 of the 1st Battle of Hebei. Germany: The Hamburgischer Correspondent, a highly respected German newspaper in Hamburg that had been in print since 1710, is dissolved by the Nazi government. Germany: A network of clinics for racial hygiene is established to collect and process data about each citizen's racial purity to determine if they are of the master race. Germany: Hitler formally announces the re-establishment of the German armed forces and creates the Luftwaffe, all which are outside the terms granted by the Treaty of Versailles. Spain: Day 259 of 985 of the Spanish Civil War. Spain: Day 624 of 985 of the Spanish Civil War. CBI - China: Day 269 of 2,987 of the 2nd Sino-Japanese War. Day 54 of 124 of the Battle of Henan. Day 9 of 15 of the Battle of Taierzhuang. Chinese guerrilla fighters destroy a Japanese supply dump at Zaozhuang by setting it on fire. Day 9 of 39 of the Battle of Xuzhou. Germany: Hitler's speech becomes too extreme to be heard by the foreign nations in fear of provoking war, so the broadcast is cutoff, leading to false rumors that Hitler has been assassinated during his speech. Eastern Front: Day 10 of 13 of the Slovak-Hungarian War, aka the Little War. For the most part, this war is over, but in some places the fighting will continue for another three days. PTO - Japan: Prototype A6M Zero fighter takes its maiden flight at Kagamigahara airfield. CBI - China: Day 634 of 2,987 of the 2nd Sino-Japanese War. Day 16 of 54 of the Battle of Nanchang. CBI - China: Day 1,000 of 2,987 of the 2nd Sino-Japanese War. Day 139 of 381 of the Battle of South Guangxi. Day 65 of 67 of the Battle of Wuyuan. The Chinese enter Wuyuan. Atlantic: German bombers sink the British tanker SAN CONRADO and Norwegian tanker HIDLEFJORD 45 miles west of Milford Haven, Wales. Atlantic: To avoid being captured by the Americans and Canadians, 8 German merchant ships are scuttled by their own crews in various South American ports. ETO - UK: Day 208 of 258 of the Blitz. Middle East: In a pro-axis coup led by Raschid Ali, he seizes all power in Iraq. East Africa: Day 296 of 537 of Italy's East African campaign in the lands south of Egypt. East Africa - Eritrea: Day 56 of 56 of the Battle of Keren. The British troops capture Asmara, the capital of Eritrea, bringing this battle to an end. CBI - China: Day 1,365 of 2,987 of the 2nd Sino-Japanese War. Day 19 of 27 of the Battle of Shanggao. CBI - Thailand: Day 183 of 221 of the Franco-Thai War (Vichy France vs Thailand). USA: The War Production Board (WPB) orders that anyone wishing to purchase a new toothpaste tube (then made from metal) has to turn in an empty one. Atlantic: Day 78 of 169 of Germany's Second "Happy Time," during which U-boats sink 609 Allied ships with little risk. To reduce the shipping losses along the eastern seaboard, the US introduces the BUCKET BRIGADE, which requires all ships to sail during daylight and at night anchor in protected harbors. Russian Front - North: Day 206 of 872 of the Siege of Leningrad. Russian Front - North: Day 53 of 102 of the Battle of the Demyansk Pocket, another failed attempt to break the siege at Leningrad. Russian Front - North: Day 69 of 103 of the Battle of the Kholm Pocket. Another attempt to break the siege at Leningrad. Russian Front - Center: Day 84 of 103 of the Battle of Vyazma, Russia. Russian Front - Center: Day 84 of 103 of the Battle of Sychevsk, Russia. Russian Front - Center: Day 30 of 49 of the Battle of Rzhev, Russia, a diversion to pull more German troops away from Moscow. Russian Front - South: Day 154 of 248 of the Siege of Sevastopol, Crimean Peninsula. MTO - Malta: Malta has become the most bombed place on Earth as the Germans and Italians have been fiercely assaulting it. Today the Luftwaffe informs Hitler that they simply cannot sink an island with bombs. CBI: Day 2 of 11 of the Japanese Naval raids on Allied ships throughout the Indian Ocean. CBI: Day 2 of 2 of the Battle of Christmas Island. The Japanese defeat the small British garrison, taking 27 POWs. CBI - Burma: Day 109 of 164 of Japan's Invasion of Burma. CBI - China: Day 1,730 of 2,987 of the 2nd Sino-Japanese War. Day 99 of 99 of the 3rd Battle of Changsha, which results in a Chinese victory. PTO - Borneo: Day 107 of 107 of the Battle of Borneo. The Japanese have now taken control of Borneo. PTO - Malaya: Day 42 of 357 of the Battle of Timor Island. PTO - Philippines: Day 115 of 152 of the 1st Battle of the Philippines. 5th Air Force provides air support. PTO - Solomon Islands: Japanese troops landed at Buka and Santa Isabel. USA: In an attempt to stem inflation, President Roosevelt freezes wages, salaries and prices and begins rationing meats, fats, canned goods and cheese. ETO - Germany: The RAF destroys a power station and a rail yard at Trier. Russian Front - North: Day 571 of 872 of the Siege of Leningrad. The Germans launch an attack but are beaten back. Russian Front - North: Day 51 of 51 of the USSR's Operation POLAR STAR, a failed offensive north of Leningrad, hoping to take the southern shore of Lake Ladoga, Russia. The Soviets abandon their offense. Russian Front - North: Day 332 of 658 of the Siege of the Kholm Pocket. MTO - Tunisia: Day 136 of 178 of the Battle of Tunisia. RAF and US Air Forces provide Allied air support. Day 10 of 16 of the Battle of El Guettar. US 1st and 9th Infantry Divisions attack the Italian positions at Hill 369. CBI - Burma: Day 102 of 104 of the 1st Battle of Arakan. US 10th Air Force provides air support. CBI - Burma: Day 53 of 79 of the Allied Operation LONGCLOTH. US 10th Air Force provides air support. CBI - China: Day 2,095 of 2,987 of the 2nd Sino-Japanese War. PTO - Alaska: Day 299 of 435 of the Battle of Kiska, Aleutian Islands. US 11th Air Force attacks Kiska Island hitting a ship in Gertrude Cove, the North Head area, the Main Camp and the beach. a bomber and fighter counter-offensive on and around Guadalcanal and the Russell Islands. US 13th Air Force fighters intercept Japanese planes over the Russell Islands en route to Guadalcanal. During a 3-hour battle, the US loses 6 planes to Japan's 20. ETO - Germany: US 8th Air Force B-24s are sent to hit targets in southwestern Germany near the French and Swiss borders. Some unintentionally bomb at Schaffhausen, Switzerland and on Strasbourg, France. Russian Front - North: Day 60 of 191 of the Battle of the Narva Isthmus, Estonia. Both German and Soviet troops in the Baltic region remain in a defensive position. Russian Front - South: Day 100 of 113 of the USSR's Dnieper-Carpathian Offensive in southwestern Ukraine. Russian Front - South: Day 29 of 45 of the Battle of Chernovtsy, Ukraine. Russian Front - South: Day 8 of 15 of the Battle of Kamenets-Podolsky Pocket, Ukraine. Russian Front - South: Day 27 of 44 of the Battle of Snigirevka, Ukraine. Russian Front - South: Day 7 of 20 of the Battle of Odessa, Ukraine. MTO - Italy: Day 76 of 123 of the Battle of Monte Cassino. RAF and US Air Forces provide air support. MTO - Italy: Day 71 of 136 of the Battle of Anzio. RAF and US Air Forces provide air support. CBI - Burma: Day 94 of 99 of the 2nd Battle of Arakan. CBI - Burma: Day 28 of 166 of the UK's Operation THURSDAY. The Japanese attack the BROADWAY site but are repulsed by the British. CBI - Burma: Day 23 of 147 of the Battle of Myitkyina. US 10th Air Force provides air support. Day 5 of 10 of an action at Nhpum Ga Ridge by the infamous "Merrill's Marauders" against 1,300 Japanese. CBI - Burma: Day 1 of 302 of the Chinese Salween Offensive. Chinese troops enter from the north to drive out the Japanese. CBI - China: Day 2,461 of 2,987 of the 2nd Sino-Japanese War. CBI - India: Day 25 of 118 of the Battle of Imphal-Kohima. Japanese troops capture Nippon Hill near Imphal. PTO - Japan: The submarine USS FLYING FISH sinks a Japanese transport off Okinawa. PTO - New Guinea: Day 33 of 80 of the Battle of the Admiralty Islands. 5th Air Force provides air support. PTO - New Guinea: Day 196 of 219 of the Battle of Shaggy Ridge. 5th Air Force provides air support. PTO - New Guinea: Day 109 of 597 of the Battle of New Britain. US 13th Air Force provides air support. PTO - Solomon Islands: Day 153 of 295 of the Battle of the Bougainville Islands. US 13th Air Force provides air support. PTO: The American submarine USS QUEENFISH mistakes the Japanese merchant ship AWA MARU for a destroyer and sinks her in the Taiwan Strait. Only one of the 2,004 on board the AWA MARU survives, for whom it was the third time in which he was the sole survivor of a torpedoed ship. The date on the newspaper reads "Monday, May 14, 2605 (20TH YEAR OF SYOWA)" (1945). 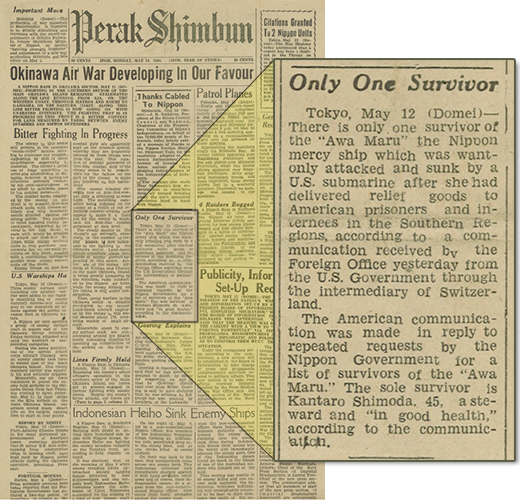 Under the agreed rules of the International Red Cross, the AWA MARU, returning to Japan after delivering supplies to Singapore for the 170,000 Allied POWs there, disclosed to the Allies the route she would be taking back home. Mistaking the AWA MARU for a destroyer, the USS QUEENFISH launched four torpedoes, blowing her in two. The sinking occurred about 10 miles off the coast of China in heavy fog. Though the AWA MARU had illuminated red crosses on her sides, she was not sounding her fog horn, as required by international treaty. The sole survivor of the 2,004 on board the AWA MARU was the Captain's personal steward, Kantaro Shimoda, 45, for whom it was the third time in which he was the sole survivor of a torpedoed ship. It's hard to say whether his nickname should have been "Mr Lucky" or "Mr Jinx." Perak Shimbun was an English language newspaper printed in Ipo, Perak, Malaya, catering to an English educated audience in the region. It was turned into a Japanese war propaganda newspaper upon occupation of Malaya by Japan. ETO - France: Day 245 of 284 of the Battle of Brittany. ETO: Day 26 of 46 of the Battle of the Ruhr Pocket. The US 1st and 9th Armies link up at Lippstadt, trapping 21 divisions of German soldiers. We've added this photo as a Day-By-Day spotlight for March 10th as well as here. ETO - France: Day 246 of 284 of the Battle of Brittany. ETO - France: Day 199 of 236 of the Siege of Dunkirk. ETO - Germany: Day 27 of 46 of the Battle of the Ruhr Pocket. Allied troops liberate Doetinchem, Borculo, Eibergen and Enschede in the Netherlands. US 9th Air Force provides air support. ETO - Germany: Day 1 of 4 of the Battle of Kassel. Patton's US 3rd Army clashes with Germans at Kassel. Russian Front - Finland: Day 199 of 223 of the Lapland War. Finland and Russia have joined forces to kick the Germans out of Finland's most northern province. Russian Front - Center: Day 169 of 206 of the Battle of the Courland Pocket in Latvia. Russian Front - Center: Day 67 of 75 of the Battle of Königsberg, East Prussia (now Kaliningrad, Russia). Soviets begin a 6-day artillery bombardment against Königsberg. Russian Front - Center: Day 51 of 54 of the Battle of East Pomerania, Germany. Russian Front - Center: Day 48 of 83 of the German Siege of Breslau (today Wroclaw, Poland). Russian Front - South: Day 7 of 21 of the Battle of Nagykanizsa-Körmend, western Hungary. The Soviets capture the vital road junction at Sopron. Russian Front - South: Day 20 of 34 of the Battle of Vienna, Austria. Soviets reach Wiener Neustadt. MTO: US 15th Air Force bombs targets in Yugoslavia and Austria. MTO - Italy: The Allies mount an offensive in northern Italy. RAF and US Air Forces provide air support for the Allied ground units. CBI - Burma: Day 57 of 99 of the Battle of Pakokku and Irrawaddy River operations in central Burma. The US 10th Air Force provides air support. CBI - China: Day 2,826 of 2,987 of the 2nd Sino-Japanese War. Day 1 of 91 of the Battle of Zhijiang. 70,000-80,000 Japanese troops attack Zhijiang in western Hunan Province in an attempt to open a way into Sichuan Province, where China's war time capital of Chongqing is located. PTO - Japan: Day 1 of 83 of the Battle of Okinawa. The final amphibious landing of the war begins as the US 10th Army invades. The Japanese Air Force counter-attacks, damaging the USS WEST VIRGINIA, USS TENNESSEE and HMS INDEFATIGABLE. PTO - New Guinea: Day 461 of 597 of the Battle of New Britain. US 10th Air Force provides air support. PTO - New Guinea: Day 345 of 481 of the Battle of Western New Guinea. US 10th Air Force provides air support. PTO - Philippines: Day 164 of 299 of the 2nd Battle of the Philippines, aka the Liberation of the Philippines or the Philippines Campaign. PTO - Philippines: Day 108 of 244 of the Battle of Luzon. 5th Air Force provides air support. US 158th Regimental Combat Team lands near Legaspi. PTO - Philippines: Day 23 of 159 of the Battle of Mindanao Island. 5th Air Force provides air support. PTO - Philippines: Day 15 of 135 of the Battle of the Visayas region. 5th Air Force provides air support. Canada: The portions of the Alaska-Canadian Highway that are physically located in Canada are turned over to the Canadian government. Greece: King George II (Georgios Kondílis), passes away. This monumental study of Hitler's empire is widely acclaimed as the definitive record of the twentieth century's blackest hours.